DELRAY BEACH, Fla. – A Delray Beach doctor arrested on accusations he inappropriately touched female patients is a free man. Prosecutors dropped both criminal charges against Dr. Manuel Abreu Wednesday. In a court filing, they wrote they didn’t have evidence to prove the crimes happened. Abreu is still facing several civil lawsuits where women in Palm Beach and Pinellas Counties have accused him of touching them inappropriately. WSVN – Good news for a South Florida doctor accused of sexual battery. Criminal charges against him have been dropped after a judge questions the credibility of his accusers. Investigative reporter Carmel Cafiero is on the case. Dr. Manuel Abreu was part of a busy medical practice in Palm Beach County just a few years ago. That changed after Dawn Basham told police he had touched her inappropriately during an office visit. Other women came forward with more accusations of inappropriate behavior by Dr. Abreu. Among them, former patients, a medical assistant and a pharmaceutical rep.
As a result, Dr. Abreu was arrested – charged with sexual battery and battery in the Basham case. He was held on a half million dollar bond. After months behind bars, his bail was reduced and he was released. And now, Dr. Abreu is free of criminal charges. They were dropped by the state after a judge listened to the testimony of five women and came away doubting their stories. By not allowing testimony of other alleged victims, there was nothing to back up the criminal charges. Attorney Adam Horowitz represents those women in lawsuits against Dr. Abreu and his employers. He says the cases are not affected by the ruling. But he’s paid a price. While the charges were pending, Dr. Abreu filed bankruptcy and testified he was unable to find work. Walter Reynoso was featured together with other distinguished attorneys as one of the leading criminal defense attorneys in the South Florida area by the South Florida Legal Guide. A confidant of former Peruvian spy chief Vladimiro Montesinos will be extradited to Peru, at his own request, “as soon as possible,” a local judge ruled Friday. Victor Alberto Venero Garrido, arrested here January 26, is accused of having a hand in money laundering and other schemes in Peru. Lawyers for 47­year­old Venero, considered Peru’s second most wanted man after Montesinos, asked a federal judge here to send their client back to Peru so that he may be treated for cancer and face the charges against him in his homeland. “I want to face justice. I have faith in my country’s justice,” Venero told the press. Federal Judge John O’Sullivan ruled Friday that Venero should be extradited to Peru as quickly as possible. He will be sent to Peru “quite possibly next week,” one of his lawyers, Walter Reynoso, told AFP. In a statement read by his lawyers after the hearing, Venero insisted that he had never given money to Peruvian President Valentin Paniagua or congressional leader Carlos Ferrero, as Peruvian officials have accused him of doing. Peruvian officials charge that Venero is one of Montesinos’s confidants and an important member of the former spy chief’s underground organization. He stands accused of arms trafficking, laundering drug money and bribing government officials. Montesinos fled Peru in October, after he was videotaped bribing a lawmaker. He has also been linked to an arms­for­drugs deal with Colombian rebels and remains a fugitive. Copyright 1994 New Times Inc.
A few months ago, while Walter Reynoso was having a cup of coffee in the federal courthouse downtown, he was approached by a distraught cafeteria worker who recognized the Coconut Grove criminal lawyer. Martha Rodriguez, a Nicaraguan immigrant, began crying as she told Reynoso about her son, who was being held without bond in the Dade Pretrial Detention Center. Nineteen­year­old Julio Lazo had been arrested the previous November and charged with trespassing and witness tampering, in connection with a murder investigation. It looked as if Lazo might never get out, said Rodriguez. Like all mothers, she was convinced her son was innocent. Though a bit skeptical, Reynoso told her he’d look into it. A mother’s intuition appears to have been right: Early in May the Dade State Attorney’s Office dropped the charges and Julio Lazo walked out of jail a free man, as did fellow defendant Oscar Sanbrana, also nineteen. For the previous six months, however, a central tenet of constitutional law appears to have been ignored. Neither Lazo nor Sanbrana was ever given a chance to present his side of the story in court. “The system failed,” declares attorney Jose Dorta, who worked on the case pro bono for Reynoso’s firm. But to the judge and prosecutors who demanded that Lazo be kept in jail without bond and prevented him from testifying in his own defense, no apologies are necessary. “I heard strong evidence supporting the allegations that this defendant was threatening a witness and the witness was going to be killed,” asserts Circuit Court Judge W.
The accusations against Lazo are part of a complex, often contradictory, web of fear and confusion that began with the 1993 murder of Carlos Santamaria, the eighteen­year­old victim shot to death in a dispute over a motor scooter. On a hot August nightElvis Morales and Reynaldo Cuello­Tito set off on a bicycle A with Morales on the handlebars A to look for the suspected thief of Cuello­Tito’s scooter. According to Morales and several other witnesses, Cuello­Tito found Santamaria in the vicinity of NW Second Street and Seventh Avenue, accused him of stealing his scooter, and then shot him three times. The murder trial is scheduled to begin July 5. It took nearly six months for the police to track down and arrest Cuello­ Tito. In the meantime, Julio Lazo and his lawyers say, Santamaria’s family and friends ­­ Lazo included ­­ were engaged in some detective work of their own. Lazo says that when he and his friends discovered that Morales had been present at the scene, they began pressuring the witness to tell them who had killed Santamaria. They had no idea, insists Lazo, that Morales was cooperating with police and had already identified the alleged murderer as Cuello­Tito. To prosecutor Thomas McCormack, the immediate threat to Morales was clear. “This guy was afraid for his life. He came into my office at least three times saying that these people had told him, ‘Don’t testify or else we’ll kill you. '” McCormack admits, however, that he is puzzled as to why Lazo and Sanbrana would have threatened Morales about testifying at the trial of their friend’s alleged murderer. “I don’t have an explanation for that. They may have been confused about what he was testifying to,” he speculates. After the arrest of Lazo and Sanbrana, McCormack requested an emergency hearing and asked that it be held ex parte, meaning that only one side would be permitted to state its case. Normally such hearings are held in a judge’s chambers, but this one, on December 14, took place in an open courtroom, while the defendants’ public defenders stood by helplessly, protesting the proceedings. “If it’s done in open court, it should be an open hearing,” assistant public defender Frederick Bragdon argues now. “It’s odd that we weren’t allowed to challenge the evidence, while they were rubbing our noses in it.” Indeed, Lazo was kept in a holding cell in the courthouse as Morales listed the various threats that allegedly had been made against him. “They said I was a snitch, and they told me they were going to kill me, and that everybody was going to beat me up,” he testified. The judge confirms that the defendants’ purported gang ties had something to do with his ruling, and with his subsequent refusals to grant bond. The officer who arrested Lazo and Sanbrana wrote in his report that the murder victim had been a “gang member associate” of the pair. Morales also stated that Lazo belonged to a gang called the Second Street Fellas, and that he had been stopped on his way to court that day by friends of Lazo warning him not to testify. (A prosecutor familiar with the case says today that he doesn’t think the murder or the alleged episodes of witness tampering were gang­ related.) In any event Lazo is, in the words of attorney Walter Reynoso, “no Snow White.” At the time of his arrest he was enrolled in a pre-trial diversion program for first offenders, having been picked up for attempting to burglarize a car. No witnesses testified at a subsequent hearing on February 3, when bond was again denied. On April 15, when Lazo’s new attorney Jose Dorta was granted another bond hearing, he brought to court six witnesses to testify on Lazo’s behalf A including relatives of the murder victim and witnesses disputing Morales’s version of the November confrontation. But Judge Spencer refused to permit the witnesses to testify. “Counsel, you know, I can only hear the same argument just a couple of times. Then I don’t have to hear it time and time and time again,” the judge declared. Dorta contended that Spencer had never actually heard a full defense of the charges against Lazo. “Basically,” he argued, “the presumption of innocence is being thrown out the window on behalf of my defendant.” Bond was denied nevertheless, and Lazo and Sanbrana remained in jail. Even though his client has finally been released, Reynoso is still upset over the long­standing refusal to grant Lazo an opportunity to defend himself. “I was pretty outraged that the judge never heard any witnesses except this one kid who made the charges,” asserts the attorney; Reynoso says Lazo is contemplating filing a false imprisonment suit. As host of Life Extension Breakthroughs, a call in show that aired until recently on Saturdays from 5:00 to 6:00 p.m. on WINZ­AM (940), Faloon urged his audience to avoid the FDA’s draconian regulations by seeking alternative drugs and therapies via his nonprofit company, the Fort Lauderdale based Life Extension Foundation. “I’d love to join your group!” enthused Iris from Miami during one broadcast. “I totally agree with everything you’re saying!” seconded Marcia from North Miami. “A fascinating program!” observed Bob, another Miamian. “Absolutely fascinating!” What Iris and Marcia and Bob probably didn’t know is that Faloon’s show is an infomercial, that the foundation paid more than $2000 for each hour long slot on WINZ. The new fans also probably had no idea that Faloon, 39, and his partner Saul Kent, 55, are under federal criminal indictment for allegedly importing unapproved drugs into the U.S. through phony foreign companies. Though these firms advertised their products as effective in battling everything from the common cold to cancer and AIDS, FDA officials claim some of these remedies are lethal if not administered with medical supervision. Others, according to the agency, simply do not work. Faloon, nonetheless, is still publicly recommending the use of many of these cures, and his Foundation is referring its members to purveyors who distribute them. In fact, Faloon says, government persecution has been a boon to his mission, and that membership in the foundation has more than tripled to 15,000 since the FDA raided Life Extension’s warehouse in 1987. The November 1991 unsealing of a 27­count criminal indictment did little to deter Faloon and Kent from their foundation related work, particularly as it relates to the distribution of unapproved drugs. The pair, each of whom remains free on $825,000 bond, cast themselves as fearless crusaders who are paying the price for standing up to the FDA. Just a few months ago they opened the FDA Holocaust Museum, a one room storefront in Fort Lauderdale plastered with propaganda decrying the evils of the regulatory agency. “We’re not afraid of the government,” Faloon insists. And he has good reason not to be. The government, after all, has shown little ability or inclination to actually bring Faloon and Kent to trial. While the defendants have hired a trio of defense lawyers, the U.S. Attorney’s Office has bounced the case like a Ping Pong ball between federal prosecutors. The trial date has been delayed a half dozen times; nearly three years after the indictment, no date is currently set. Last month, in fact, the entire case file A all nine volumes A was transferred from federal Judge Jose Gonzalez to a new judge, Daniel Hurley. The cat and mouse proceedings began more than ten years ago, when Stephen Ruddel, an eccentric real estate mogul, put up $100,000 seed money for Faloon and Kent to launch the Life Extension Foundation. The partners were prominent members of a movement devoted to attaining immortality through technology and experimental drugs A or “nutritional supplements,” as Faloon calls them. Besides providing information about alternative health research, the foundation made no secret of its efforts to sell these drugs, which weren’t approved by the FDA for use in this country, through a booming mail order business. In 1986 a Hollywood Police SWAT team raided Ruddel’s office and discovered what they characterized as a cocaine lab. Ruddel was arrested on drug­ trafficking charges – he later entered into a plea agreement on drug­ possession charges. Eight months later FDA agents raided the Life Extension Foundation warehouse, located in the same building as Ruddel’s office, and seized hundreds of products and documents. Undaunted, Faloon moved the foundation’s headquarters to Davie. Saul Kent relocated to Riverside, California (where he still lives) to tend to his ailing mother. “Tend” doesn’t really do justice to what happened next, however. Faloon and Kent are both disciples of cryonics, a process grounded in the theory that doctors will eventually develop the technology to bring the dead back to life ­­ if they have been properly frozen. In December 1987 Kent checked his dying mother out of her nursing home and transported her to Alcor, a cryonics laboratory in Riverside. Within hours Dora Kent was dead, and a team of lab technicians A none of them actual doctors A had cut off her head. The Riverside coroner eventually ruled Dora Kent’s death a homicide; police raided Alcor, but no charges were pressed. The location of Dora Kent’s head remains a mystery. In Florida, meanwhile, two grand juries were poring over evidence of the Life Extension Foundation’s shady dealings. According to the indictment handed down in 1991 Faloon and Kent shipped unapproved drugs into the U.S. and sold them to foundation members through two overseas companies ­­ the Longevity Institute and the Hauptmann Institute ­­ that amounted to little more than mail drops. Prosecutors contend that the defendants went so far as to create fraudulent promotional material for these outfits, and they intend to prove that Dr. Karl­Gustav Hauptmann, director of the Hauptmann Institute, is nothing more than a model in a lab coat. In the meantime their lawyers have filed voluminous pretrial motions, which have helped to delay the proceedings. In all the defendants have filed seven motions to dismiss the case, plus an eighth to suppress the evidence collected during the 1987 raid. The motions, which include thousands of pages of documentation, required two separate evidentiary hearings. Last month, before he transferred the case, Judge Gonzalez denied all eight motions. By Faloon’s estimate, the legal work has cost him and Kent $1.2 million so far; Faloon says the money for their defense comes primarily from the foundation’s $50 annual membership dues. “Though we are nonprofit, we do generate a surplus here, a healthy surplus,” he explains. “In addition to membership, we sell books and tapes and vitamins.” Faloon says the Foundation also donates money for research, primarily cryonics related. Those alternative therapies can also be encountered at the FDA Holocaust Museum, the back room of which operates as the Foundation’s makeshift headquarters. The one room museum, tucked in a strip mall at 2490 Griffin Rd., is blanketed with exhibitions that consist mostly of books and articles about life extension, as well as placards equating the FDA to Nazis. The video library comprises a TV set and VCR stationed on one side of the room. Next door, at the foundation’s tiny retail shop, customers can choose from a variety of health products, including Cognitex (a brain nutrient) and Cartilade (a tumor­shrinking product derived from shark cartilage). During one recent weekday visit, a New Times reporter posing as a visitor was greeted by Steve Hennenfent, the museum’s curator. After he finished his conversation with the cancer patient’s family, Hennenfent offered to sell the visitor an ozone machine for $1500. “Wouldn’t that be illegal?” the reporter asked. “Not if the machine is officially used for water purification,” Hennefent said. “But how would I know how to use it for medical purposes?” the reporter persisted. “I could supply you with the protocols instructions for how to use it,” Hennenfent offered. When asked about ozone, Bill Faloon initially told New Times the Life Extension Foundation had taken no position regarding the controversial remedy. “We don’t know if it works or not,” he conceded. As of June 25 Faloon will be buying airtime for his Life Extension Breakthroughs program on WPBR­AM (1340) in West Palm Beach. MIAMI Victor Alberto Venero Garrido, a close associate of former Peruvian intelligence chief Vladimiro Montesinos who was arrested in Miami by the FBI on a Peruvian warrant, was scheduled to fly home to Lima Friday night, said Walter Reynoso, one of his attorneys. Venero, an arms dealer accused of pilfering more than $100 million from a government pension fund, will be treated for colon cancer in a Lima clinic while he awaits a court date there. Peruvian prosecutors hope that Venero will help the government in its investigation of Montesinos, who is accused of selling arms to Colombian guerrillas, drug smuggling and money laundering. But Reynoso said no deal has been struck. Montesinos’ own corruption scandal, in which he’s videotaped offering a bribe to a congressman, helped topple the government of former President Alberto Fujimori. HIALEAH Fire injures man, and another destroys business. Two separate fires Friday night, less than two hours and a couple of miles apart left one man injured and destroyed a welding retail store. Arsenio Rodriguez, an owner of D&M Repair at 1630 W. 31st Pl., suffered second degree burns to his face, neck and chest while working on a client’s carburetor before 6 p.m. He was taken to Jackson Memorial Hospital where he was in serious condition. Just two hours earlier, firefighters were called to Air & Welding Supply, 485 W. 27th St. No one was injured in that fire, but the building was declared a total loss. BROWARD COUNTY Convicted killer, 14, loses 3 court motions Lionel Tate, the 14-year old convicted of firs degree murder in January for the body slamming death of a 6-year old playmate in 1999, lost legal ground in his bid for leniency in Broward Circuit Court on Friday. His attorneys lost three successive motions: one to get the boy out of jail while he waits to be sentenced, one to force prosecutor Ken Padowitz to give a statement outlining pretrial discussions with Lionel’s trial lawyer and one to stop the proceedings to have Lionel evaluated for competence. Broward Judge Joel Lazarus will hear more arguments next week before sentencing Lionel on March 9. ETC. Marlins add attorney to stadium deal lineup Miami: The Florida Marlins have a new cleanup hitter in the team’s efforts to build a $385 million ballpark in downtown Miami high-octane attorney Hank Adorno. A game plan has not been worked out. The city of Miami, at the request of the city’s commissioners, has hired an independent consultant to review competing site proposals for the stadium at Bicentennial Park, the Miami Arena and the Miami River. The consultants will make a recommendation to Miami City Manager Carlos Gimenez before the City Commission votes to select a site March 15. Biscayne Bay: A sunken sailboat rested partially on its side in the waters between the Venetian and MacArthur causeways Friday. As the Coast Guard and Florida Marine Patrol issued a navigational warning, they tried to find out who owned the crewless vessel. Copyright 1998 New Times Inc. When there’s a huge drug trial in Miami and no one watches it, does it even matter? If Walter Reynoso was apprehensive, he didn’t show it. Reynoso was about to give his closing statement last week in the federal drug conspiracy trial of six men, including his client, Fritz LaFontante. The handsome lawyer, in a dark suit and white shirt with cuff links, launched into an aggressive speech about defects in the government’s case against LaFontante. “Their evidence stinks and their witnesses stink,” he intoned. Then, mustering imponderable confidence, he acknowledged a central problem with his defense. “Now, ladies and gentlemen, Fritz is not here; I’m not going to try and hide my head in the sand about that.” LaFontante apparently didn’t think the government’s case so malodorous. In September, two weeks into the trial, the Haitian citizen fled, jumping a $250,000 bond and leaving his lawyer the unenviable task of defending an empty chair. Reynoso argued with admirable gusto that LaFontante took off because he was a scared man wrongly accused by the most powerful government on Earth. It didn’t work. When the jury found all the defendants, including LaFontante, guilty last Friday, it capped a bizarre case that displayed the problems of prosecuting international drug conspirators: Defendants disappear, subpoenas are brushed off, and other countries’ financial records can’t be obtained. In fact LaFontante is in good company on the lam. Three others who were indicted are also fugitives, including Joseph Michel Francois, the former police chief of Port au Prince and a key player in the military coup that ousted President Jean Bertrand Aristide in 1991. (A 1994 invasion by U.S. troops restored Aristide.) Francois is now in Honduras, where a judge refused a U.S. extradition request in July. Despite scintillating tales of international intrigue and wholesale corruption across the Caribbean, this was one of the least watched drug trials in recent Miami history. After reporting on the indictment in 1997, the Miami Herald and most other media avoided proceedings that were perhaps too long and complicated for daily coverage. The government claimed the defendants were part of a conspiracy orchestrated by the Colombian drug cartels to use Haiti as a transfer point for United States-bound cocaine. Officials from Port au Prince to Miami were bribed for that purpose. Found guilty: Joel Audain, a U.S. Immigration and Naturalization Services agent, stationed at Miami International Airport; Marc Valme, appointed by Francois as security chief for the Port au Prince International Airport; Fernando Burgos Martinez, a Colombian who the feds say was cocaine overlord Pablo Escobar’s representative in Haiti; and Reginald Molin and Luckner Guillaume, two Haitians accused of coordinating drug couriers. The trial was a marathon two-month affair. It involved more than 800 pieces of evidence, 57witnesses, and 427 kilos of seized cocaine. Witnesses included not only DEA, IRS, and U.S. Customs agents, but a man whose identity was so sensitive prosecutors asked Judge Federico Moreno to remove his name from trial transcripts. He described several key transactions then disappeared into the federal witness protection program. By trial’s end even the five defendants seemed bored. They sat impassively behind their lawyers, on occasion smiling wanly at Moreno’s puns and exchanging mints. Now and then one would perk up when prosecutor John Kastrenakes mentioned his name. Valme, an officious looking man in a blue blazer, listened on headphones connecting him to a Creole translator. Burgos, a small pale man with a forlorn face, listened to a Spanish translator. Audain made knowing glances to his mother, who sat in the audience. Kastrenakes’s complicated tale included some of the most notorious characters in the New World. He claimed that in June 1987, Colombian cartel leaders Escobar, Jorge Luis Ochoa, Jose Gonzalo Rodriguez Gacha, and others pooled their resources to open a drug route to the United States through Haiti. They appointed Burgos to bribe Haitian Colonel Jean Claude Paul, who then allowed drug-laden Colombian planes to land in Haiti. Burgos then teamed with Francois to smuggle the cocaine into the U.S. through the Port au Prince airport, where Valme was security chief. Drug couriers escaped detection at Miami International Airport with the help of INS agent Audain and a county airport security worker named Evens Gourge, who pleaded guilty in November 1997 and testified against Audain. Kastrenakes alleged Haitian police protected the enterprise, which he said had conveyed 33 tons of drugs into the United States since 1987. The evidence was impressive: dozens of wiretapped conversations, bank accounts containing hundreds of thousands of unexplained dollars, and witnesses who confessed to helping the defendants move the drugs. Moreover Kastrenakes noted that Audain’s civil service job paid between $30,000 and $40,000 a year (depending on overtime and raises), yet he had bank accounts in Jamaica and the Cayman Islands with balances of more than $100,000. Audain’s lawyer, Martin Roth, explained that his client diligently saved money, started a side business (with one of the other defendants as a partner), and earned extra income leasing a property. LaFontante’s cellular phone may have provided the key to his prosecution. The feds produced records showing 15 calls on August 22, 1995 to a man authorities caught with 22 kilos of cocaine. The defendants who were present in the courtroom last week will face ten years to life when they are sentenced in February. Authorities will continue trying to round up those who couldn’t make it. Defending an absent client was a challenge, Reynoso concedes, but at least now he doesn’t have to slog through the appeal process. And despite the guilty finding, he made out okay. “I got paid in advance,” he says. Eight months ago, Mario Vega, captain, U.S. Army (Ret. ), saw his career and his life heading for the abyss. The slide started in a Wal-Mart parking lot in Northwest Dade, where he delivered $300,000 in cash to an undercover Customs Service agent. By June, Vega, 40, had lost his job as a teacher in a Reserve Officer Training Corps program at Jackson High School, his car, his house and his credit. But now, the government has reassessed Vega’s role as an alleged conspirator in a 250-kilogram cocaine case. At the request of prosecutors, U.S. District Judge Shelby Highsmith dismissed the indictment against Vega and his wife, Hilda. “My wife and I have gone through a nightmare,” Vega said Tuesday, one day after he was scheduled to stand trial. “You cannot believe the agony we have lived through for eight months.” For nearly 20 years, Vega said, he served his country in Korea, Central America and at various bases around the United States. In the 1980s, Vega was posted to the U.S. Embassy in San Salvador, where he says he held a “top secret” security clearance. Whatever trust the government may have had in him evaporated at the sight of Vega delivering a large sum of cash to the undercover agent. “He delivered $300,000 to a guy who contacted him by a beeper,” said Wilfredo Fernandez, spokesman for the U.S. Attorney’s Office in Miami. Fernandez would not discuss why the charges were dropped. Five others in the case have either pleaded guilty or had the charges against them dismissed. Why were the Vegas in a parking lot delivering drug money on a weekend? In court documents, the government indicated the money exchange in Miami coincided with the delivery of 250 kilos of cocaine in New York. The dope deal, according to court papers, was arranged by agents who were dealing with a ringleader in the Dominican Republic. Mario Vega says he handled the cash as a favor for a relative who operated a money changing service in New York. The relative was not indicted. “I was told the money was for people negotiating the purchase of vehicles here in Miami for export to Santo Domingo,” he said. “It was an urgent transaction. That’s the reason they were doing it on Saturday.” But the money, according to Customs agent John Reddin, was a down payment to transport the cocaine. According to Reddin’s affidavit, Hilda Vega, identifying herself as “Yolanda,” made the initial phone call to undercover agents about the money. She said “Mario” was on his way. At 2:40 p.m. April 1, Mario took the cash in his burgundy Acura to the Wal-Mart on Northwest 57th Avenue, north of the Palmetto Expressway. He demanded identification before turning over the money. After the exchange, agents contacted Vega and told him the count was about $1,000 short. Vega moved to remedy the shortfall three days later. “Something that dopers don’t do,” said Reynoso. The Vegas were arrested. Both faced a potential 20 years in prison. The Dade School Board fired Mario Vega from his teaching position in June. Vega hired Reynoso to defend him and his wife, drawing down his Individual Retirement Account to pay legal fees. Reynoso says he hired two mock juries, which concluded that the Vegas were innocent. The defense was also poised to summon high-ranking military men as character witnesses at the trial. They weren’t needed. Now, Vega is moving to reclaim his teaching job. The course of study: leadership education training. Reynoso likes his client’s chances. “We feel confident we’ll get it back,” he said. A story Wednesday on Page 1B about the dismissal of drug conspiracy charges against a Dade couple incorrectly said Miami attorney Walter Reynoso represented both Mario and Hilda Vega. 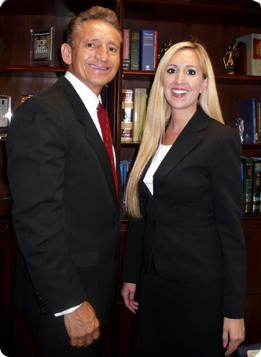 Miami attorney Richard Patino represented Mario Vega, while Reynoso represented Hilda Vega.